Dobson says Sen. Obama is "dragging biblical understanding through the gutter"
(CNN) -- A top U.S. evangelical leader is accusing Sen. Barack Obama of deliberately distorting the Bible and taking a "fruitcake interpretation" of the U.S. Constitution. 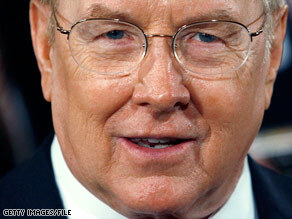 James Dobson says Barack Obama is distorting bibical teachings to fit "his own confused theology." In comments aired on his radio show Tuesday, Focus on the Family founder James Dobson criticized the presumptive Democratic presidential nominee for comments he made in a June 2006 speech to the liberal Christian group Call to Renewal. In the speech, Obama suggested that it would be impractical to govern based solely on the word of the Bible, noting that some passages suggest slavery is permissible and eating shellfish is disgraceful. "Which passages of scripture should guide our public policy?" Obama asked in the speech. "Should we go with Leviticus, which suggests slavery is OK and that eating shellfish is an abomination? Or we could go with Deuteronomy, which suggests stoning your child if he strays from the faith? Or should we just stick to the Sermon on the Mount? "So before we get carried away, let's read our Bible now," Obama said, to cheers. "Folks haven't been reading their Bible." He also called Jesus' Sermon on the Mount "a passage that is so radical that it's doubtful that our Defense Department would survive its application." "I think he's deliberately distorting the traditional understanding of the Bible to fit his own world view, his own confused theology," Dobson said, adding that Obama is "dragging biblical understanding through the gutter." Responding to Dobson's comments Tuesday evening, Obama sharply disputed the suggestion he was distorting the Bible. "Someone would be pretty hard pressed to make that argument," he told reporters aboard his campaign plane. "It is a speech that affirms the role of faith not just in my life but in the life of the American people, that suggests that we make a mistake by trying to push faith out of the public square." "I do make the argument that it's important for folks like myself, who think faith is important, that we try to translate some of our concerns into universal language so we can have open and vigorous debate rather than having religion divide us," Obama said. "And I do suggest that the separation of church and state is important. But there's no, no theological work being done in that speech in terms of the Bible." Joshua DuBois, Obama's national director of religious affairs, said the Illinois senator is "committed to reaching out to people of faith and standing up for American families." "A full reading of his 2006 Call to Renewal speech shows just that," DuBois said. "Obama is proud to have the support of millions of Americans of faith and looks forward to working across religious lines to bring our country together." DuBois had earlier called Focus on the Family to suggest a meeting with the group ahead of the Democratic Party's convention in late August, according to Tom Minnery, the organization's senior vice president for government and public policy. Minnery wouldn't say whether any such meeting is planned but said the group is open to it. Dobson also takes aim at Obama for suggesting in the speech that those motivated by religion should attempt to appeal to broader segments of the population by not just framing their arguments around religious precepts. "Democracy demands that the religiously motivated translate their concerns into universal rather than religion-specific values," Obama said. "It requires their proposals be subject to argument and amenable to reason." Dobson said the suggestion is an attempt to lead by the "lowest common denominator of morality." "Am I required in a democracy to conform my efforts in the political arena to his bloody notion of what is right with regard to the lives of tiny babies?" he asked. "What he's trying to say here is, unless everybody agrees, we have no right to fight for what we believe. "What the senator is saying there, in essence, is that 'I can't seek to pass legislation, for example, that bans partial-birth abortion, because there are people in the culture who don't see that as a moral issue,' " Dobson said. "And if I can't get everyone to agree with me, than it is undemocratic to try to pass legislation that I find offensive to the Scripture. Now, that is a fruitcake interpretation of the Constitution." According to Minnery, Dobson was particularly offended by a portion of the speech in which Obama mentioned evangelical leader and the Rev. Al Sharpton. In the speech, Obama said, "Even if we did have only Christians in our midst, if we expelled every non-Christian from the United States of America, whose Christianity would we teach in the schools? Would we go with James Dobson's or Al Sharpton's?" In response, Minnery said, "Many people have called [Sharpton] a black racist, and [Obama] is somehow equating [Dobson] with that and racial bigotry." Dobson's comments follow the Obama campaign's recent efforts to increase its appeal among evangelicals, many of whom have expressed reservations about supporting Sen. John McCain, the presumptive Republican nominee. Dobson himself has said he will not vote for the Arizona senator. Minnery said he doesn't expect Obama to make inroads into the reliably Republican voting bloc. "Evangelicals are people who take Bible interpretation very seriously, and the sort of speech he gave shows that he is worlds away in the views of evangelicals," he said. Minnery also said Dobson will probably continue his criticism of Obama. "Given our fact that religion seems to be such a relevant topic in this election again, we will defend the evangelical view vigorously," he said.